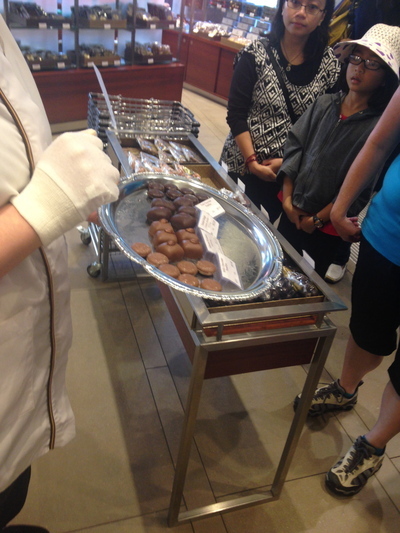 Some guests on a recent chocolate walking tour, enjoying these treats from Haigh's Queen Victoria Building. Chocolate paradise at the Queen Victoria Building. Welcome to Haigh's. This chocolatier has come a long way - since Alfred Haigh founded the company back in 1915. Haigh's initially started off in Adelaide, and as of the 5th of December 2012 - the Queen Victoria Building store opened. This is the second Haigh's store to open in the city. The 14th Haigh's store opened to date at the time. Off hand, it was back in 2005 that their Strand Arcade store opened. Love the Queen Victoria Building store. It is a great place to start the chocolate walking tours that I run, and the chocolate spells quality all over. The opulence and glamour that is the Queen Victoria Building ensures that Haigh's is well and truly at home here. The latter is certainly true, and especially with the abundance of space to browse and buy. Even better, the customer service here is truly top notch and professional. There are some helpful staff members including Nicole. If there is a chocolate sensation you have in mind, such as chocolate toffee - this Haigh's store seems to have everything you need. Love their cherry chocolate truffles. 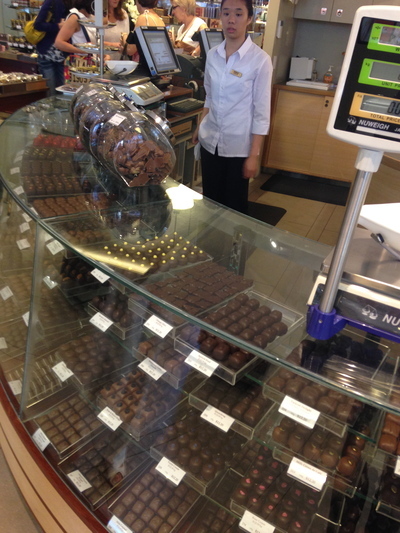 The service is polite, and it is a real pleasure to come here and buy some quality chocolate. Kelly has a well trained team. 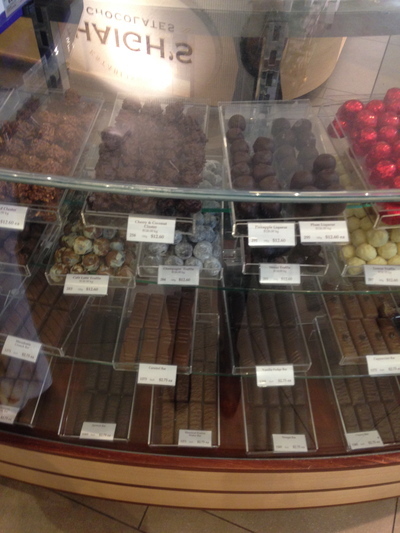 A great range of truffle treats at the front counter. I also like their dark and milk chocolate pastilles. They can also be purchased in a handy tin that can be refilled. Some kid friendly chocolates are also available at this Haigh's store. Love the milk peppermint chocolate frogs. So beautiful. So divine. A well organised and clean store. It is easy to find what you require here. Furthermore, there have been many guests on previous tours who have e-mailed me back to thank me for bringing them to this chocolate shop in particular. Comments such as "my sister in law loved these treats from Haigh's" for example, are getting fairly common in my inbox. Additionally, all of my guests on the last two previous tours have left with massive smiles on their faces, as they continue to walk with me in the beauty that is the Queen Victoria Building. Comes highly recommended. Worth a visit. You cannot miss chocolate paradise here. Chocolate paradise is found on the corner of George and Druitt Streets in the city. 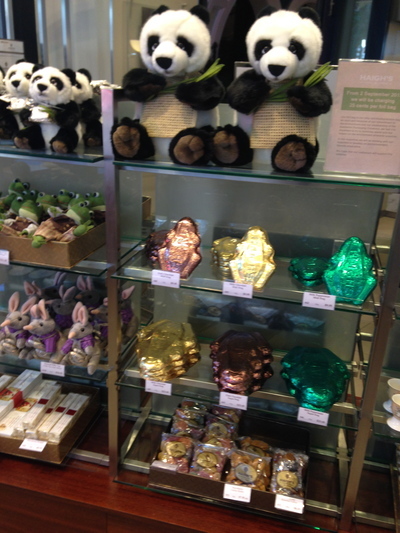 Where: Haigh's Chocolates, Queen Victoria Building. Why: Quality chocolate, and fantastic service. 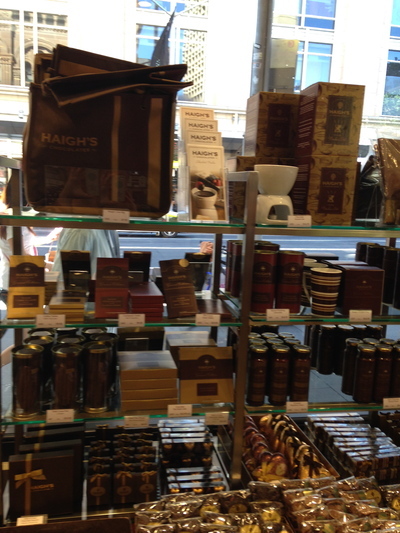 A Sydney based Haigh's chocolate shop with ample space. I’ve been in this store a few times, because I just love dark chocolate, but sad to say, I’ve never felt the urge to buy anything, which is rather strange! I live in Sydney, & have been to the store, but I had to leave without buying anything, because I couldn’t make up my mind what I wanted to buy!